Milwaukee Streetcar on Milwaukee St. According to mayoral candidate Bob Donovan, the cost of the Milwaukee Streetcar just went up by $25 million. Donovan made the claim on Facebook following a ruling by Milwaukee County Circuit Court William Sosnay that the city must pay to relocate utilities for the streetcar project. Donovan’s Facebook post notes that the $128 million project “[has risen] to nearly $150 million with the City’s added responsibility to cover utility relocation costs.” Is he correct? 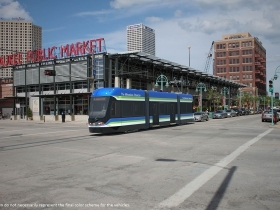 Despite the ruling from Sosnay, the cost of the Milwaukee Streetcar didn’t go up. The approved budget for the project already included the utility relocation being paid for by the city. 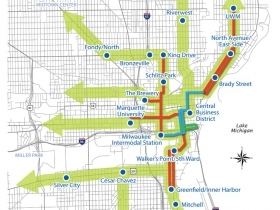 The reality for the Milwaukee Streetcar project is business as usual. Groundbreaking is still scheduled for this spring and the project budget for the first two phases plus lakefront spur is still $128.1 million. It should come as no surprise that Donovan would seize on this information less than 48 hours before a primary election. The south side alderman has been a long-time opponent of the Milwaukee Streetcar and its champion Mayor Tom Barrett and has attempted for years to use the project as a wedge issue in his campaign for mayor. Donovan was a vocal supporter of a failed attempt to require a referendum to approve the project. Will he succeed at the ballot box? We’ll find out tomorrow when election results are announced. The lawsuit was originally filed in November 2014 by the City of Milwaukee. The case dealt with legal authority issues between local governments and utilities, and the city’s ability to use what are known as “police powers” to regulate the utilities. The lawsuit also dealt with a 2013 state law, passed as part of the budget, that requires cities to pay for utility relocation costs specifically for streetcar projects. For other transportation and street projects, utilities must pay relocation costs. The lawsuit was filed following a challenge to the Public Service Commission by Oconomowoc resident and MacIver Institute president Brett Healy. Healy’s petition as a We Energies ratepayer resulted in a April 2014 PSC ruling that the city was liable for the costs related to the streetcar project. The PSC decision came as a surprise, after initial deliberations showed the regulatory body siding with the city. The Public Service Commission praised the ruling. 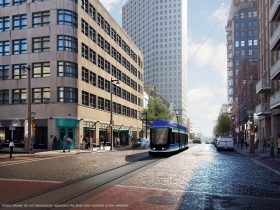 “We applaud the circuit court in upholding the PSC’s decision and stand by the fact that Wisconsin’s utilities should not be required to bear the cost of relocating or modifying their infrastructure for the streetcar project,” PSC spokeswoman Elise Nelson said in a statement. City officials and project consultants continue to work with We Energies and other affected utilities to reduce the need for utility relocations. These changes have included relocating the planned tracks from E. Wells St. to E. Kilbourn Ave. and consolidating the line to N. Jackson St., instead of being splitting over N. Jackson St. and N. Van Buren St. Adjustments are normal for large public works projects. The Marquette Interchange, an $800 million-plus, project saw an estimated utility relocation fee of $120 million reduced to $23 million by design changes. 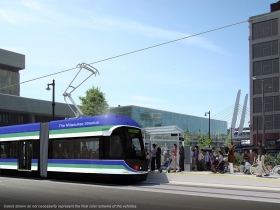 As the ruling confirms, the streetcar project is unique in that it requires the city to pay for the relocations, not the utilities. 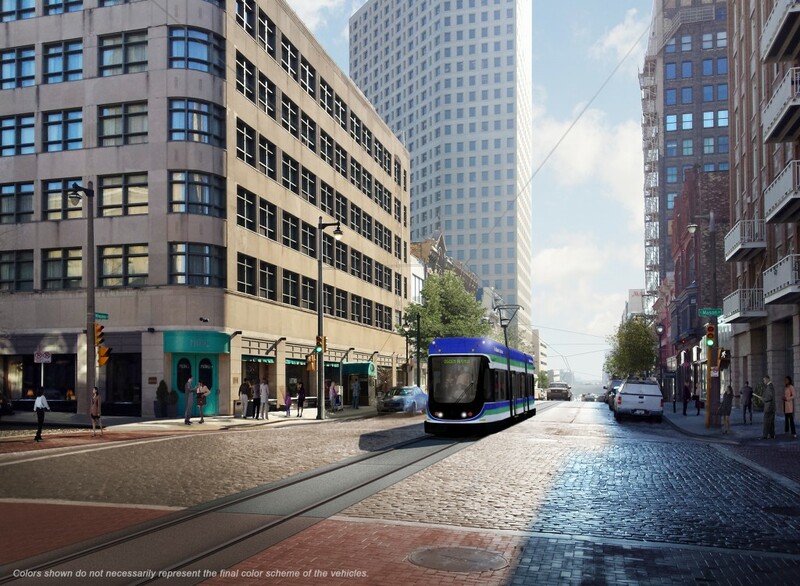 Streetcar projects across the country have faced similar challenges, with Atlanta winning their case against AT&T over who should pay for relocation. 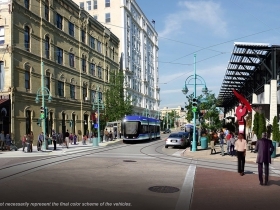 The streetcar project was originally approved by the Milwaukee Common Council on February 10th, 2015. At the time the project had a budget of $123.9 million, including an estimated $10 million federal grant for the lakefront spur. In October of last year the city received a $14.2 million Transportation Investment Generating Economic Recovery (TIGER) grant, which increased the project budget to $128.1 million. The added costs will go towards double-tracking a segment of track to the maintenance facility, as well as other improvements. A federal congestion mitigation and air quality grant will pay for 80 percent of the operating costs for the first 18 months, with a possible 18-month extension. Operating costs will be covered by farebox revenue, advertising, corporate sponsors and the parking fund. Operating costs are estimated at $2.65 million annually. Service on the first phase of the system is on-track to begin in early 2018. Is Donovan writing all of this himself? It seems unlikely. As I reported last July, Donovan has hired Steve Schumacher to manage his campaign on social media. Schumacher continues to be the highest paid member of Donovan’s campaign staff, making nearly $30,000, about 20 percent of the $124,000 Donovan has raised in campaign funds since January of last year. “Barrett’s Trolley Folly Steams On! 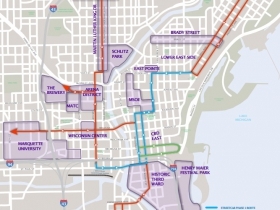 A judge’s decision last week makes $25 million in utility relocation cost related to Mayor Tom Barrett’s downtown streetcar project the responsibility of City of Milwaukee property taxpayers. The truth is the additional $25 million will come from the streetcar’s TIF (tax incremental financing). TIF money is generated by diverting property tax revenues that would otherwise go to MPS and other governmental agencies and departments. Mayor Barrett sold his downtown streetcar to nine members of the Common Council (I and fellow mayoral candidate Alderman Joe Davis have long opposed the streetcar) at a cost of $124 million—the price tag rises to nearly $150 million with the City’s added responsibility to cover utility relocation costs. This nonsense will not continue if I am elected the next Mayor of Milwaukee—I will stop Mayor Barrett’s stupid, wasteful streetcar dead in its tracks! Bathroom Bob Donovan lied? I for one am SHOCKED! -_- Thankfully we only have less than 2 months before he loses to Barrett. Back in November 2014, Barrett wanted a total of $114 million, including the high utility relocation costs. Now, the total budget is apparently $128 million. Donovan’s numbers might be off, but he’s right that the costs keep increasing. Further, the longer it takes to close the TIFs, the longer it takes before those property taxes flow to general revenues. James, the extra $14 million was for construction of the Lakefront Line (Phase Two) of the streetcar. The line is funded through a $14.2 TIGER grant from the USDOT. It doesn’t matter if it’s true or not. Sadly, it doesn’t have to be true for talk radio to pick up on it and report it as fact. People believe what they’re told. It’s out there. 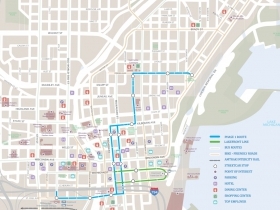 The original downtown streetcar loop, minus utility relocation costs, would cost $64.6 million. The new proposal adds money for the lakefront spur, and to potentially cover the cost of relocating underground utilities for the streetcar. Including spending for utilities and lakefront spur, the budget increases to $113.9 million for 4.6 miles of track, Barrett said. Budget of $114 million including “spending for utilities and lakefront spur.” As a result, the $14 million TIGER grant, which was awarded months later in 2015 for the lakefront spur should have not increased the $114 million to $128 million. Instead, the grant would have reduced the “budget” to less than $100 million. Either Barrett misspoke when he said $114 million budget, was misquoted, or the $14 million “saved” through the grant is being spent elsewhere within the now $128 million project budget. It’s still chump change compared to what is being spent on highways. I am in favor of highway spending, by the way. I’m also in favor of alternative transportation. We need them all and we can afford them all. @mrbradleyc City officials apparently agree with you. I was curious about the point that @andrew was making. In February 2015, as part of Phase 1, the City Council approved $15 million for the Lakefront Line. But then the $14 million grant was awarded. Rather than applying the $14 million grant against the budgeted $15 million, the City decided to combine the monies, and now a total of $29 million is being spent on the 1/4 mile Lakefront spur. So @andrew is correct, the $14 million grant increased the $114 million project to a $128 million project. No need to cut the TIF levy by $14 million, or spend the money on streets. While I was reading the streetcar’s $25,000 public info website run by a $183,000 consultant, I learned that the Lakefront Spur will bring thousands of additional people to the lakefront and Summerfest. A well spent $29 million. Good thing there is large amount of public restrooms in plans for the new Gateway and the Coture’s public space. No need for a porta-potty city on the Plaza during Summerfest. @andrew I dug a little further, and you are correct. In February 2015, the City budgeted $15 million for the Lakefront Spur as part of Phase 1. When the $14 million grant was awarded in October 2015, that amount was added to the original $15 million. As a result, $29 million is being spent on the 1/4 mile Lakefront Spur, and the total spend for the entire project went from $114 million to $128 million. The project budget was never $114 million. It was $123.9 million. The city received that grant at $14.2 million in October 2015. The additional funds will allow for the purchase of another vehicle or insulate the city on cost overruns (a figure for which is already set into the budget). Final engineering work is not as far along on the lakefront spur. Jeramy, did you attempt to contact Donovan for a reaction to your story? No? Why? I think perhaps if confronted with reality he might have appreciated an opportunity to retract. Maybe not, but you never know. Please don’t make me laugh convulsively in public. It’s embarrassing. Something tells me Bathroom Bob probably doesn’t care if he was being factual or not… either way, damage done, his supporters already took the false talking point and are spreading it. Luckily most of his supporters do not live in Milwaukee. James, you are correct that the streetcar budget has increased, but it doesn’t look like this is just higher costs for the same thing. The City originally cut corners to fit the streetcar into its budget, and once new money (the TIGER grant) arrived, it restored some of those cuts. The one example I see is adding a second track west of 2nd Street. Until late 2015, they planned just a single track from the maintenance facility (4th & Clybourn) to 2nd Street. On 4th Street, it would be run in the southbound lanes (requiring garage-bound streetcars to operate against traffic). On St Paul, it would run up the middle of the street, reducing both east- and west-bound traffic lane width. Once the TIGER grant arrived, a 2nd track was added. This isn’t unneeded fat; it would otherwise be built when the extension up 4th Street was approved. By building this now, there are long-term savings plus the ability to better locate the track on St. Paul. Bathroom Bobby D knows he’s lying, he doesn’t care. His demographic is the old, white, angry conservative on the south side. The problem is there aren’t enough of them living in the city. At best he’s going to break even on the south side and get 50% of the vote against Barrett. Then he’ll be drowned by the east and north sides. @Andy – Donovan, through various parties, has consistently refused to comment on any streetcar story I’ve written. Kind of off topic, but what can a streetcar do, that a bus can’t? According to the City, tracks = adjoining development. According to the County, high speed buses = adjoining development. They both want to run from downtown to the Medical Center. James, Tnx for the links. More reasons to stop the streetcar project: http://usa.streetsblog.org/2015/02/20/atlanta-streetcars-early-ridership-numbers-disappoint/ Buses are better.